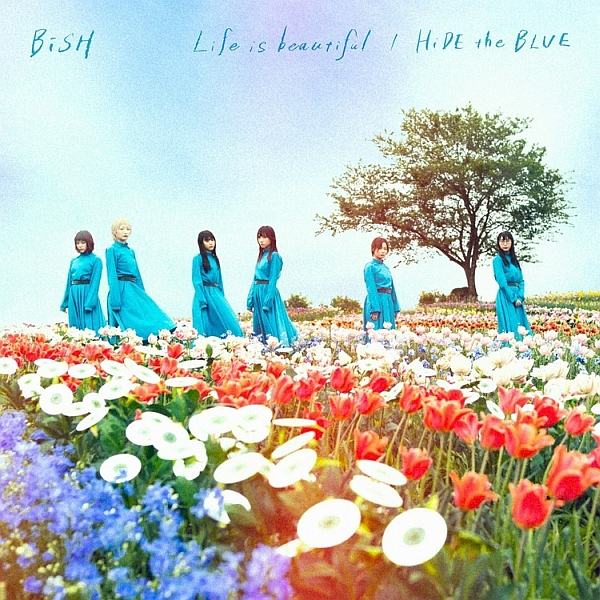 My thoughts on “Life is beautiful / HiDE the BLUE”, the latest single from BiSH. Well, it’s that time again folks. Time for another new single from BiSH, who are arguably one of the few success stories when it comes to the “Alt Idol” genre. Kinda crazy when you actually think about it, but the major label record deal, promotional songs for TV shows and Aina’s various collaborations with big time producers don’t lie. Even if you might not be a fan of the current state of BiSH’s music you hopefully aren’t grudging them their success. Speaking of promotional songs for TV shows, this single has two of them. With “Life is beautiful” serving as the theme song for the drama “Kareshi wo Ron de Kaimashita” and “HiDE the BLUE” being the ending theme song for the “3D Kanojo: Real Girl” anime. You’ve got to hand it to Avex, their marketing machine really is getting BiSH and their music into places that you wouldn’t think they’d have reached a few years ago. One of the perks of major label status I suppose. Of course said status and marketing does come with what many people might consider some drawbacks. Given that both of these songs are being used to promote TV shows I’m not expecting anything too crazy here. I imagine they’ll be along the same lines as the past couple of BiSH a-sides that have also been promotional songs. I’m sure this will enrage a certain subset of BiSH fans who pine for them to go back to their more Punk roots but it is what it is folks. Let’s get into the review. Let’s start off with “Life is beautiful”, which is a love song if the lyrics that I’m looking at are anything to go by. The MV certainly makes it seem like one too, and is also a little difficult to watch given recent personal happenings in my life. You know what, I kinda like how the song starts. The lyrics have a nice flow to them in a way that I wasn’t exactly expecting. Sadly that doesn’t really stick around too long though. Once the song gets a bit of momentum (is that even the right word here?) behind it the vocals settle into a fairly slow paced, rather sad sounding delivery which is great if that’s what you’re looking for. The instrumental is a fairly nice electro-acoustic sounding affair that compliments the vocals well and offers a constant if not maybe overly simplistic backdrop for proceedings. It’s not a bad song at all, just not what most people want from BiSH right now. On to “HiDE the BLUE” and boy does that opening instrumental sound all too familiar at this point. I usually have a chuckle to myself when people say all of BiSH’s recent songs are “Orchestra” clones but I can’t really defend that opening piano arrangement here. Now granted the rest of the song is noticeably different unless you’re being deliberately argumentative but this song does fall squarely into the “radio friendly BiSH” category as opposed to the balls to the wall, scream and shout Punk tunes people are clamoring for. I liked the piano bits for what it’s worth but that’s just me. Vocally is where I’m in two minds about this song. There are certainly some individual moments of brilliance here but the chorus is kinda just there and you do end up feeling like we’re just slapping a new coat of paint on some tried and true ideas. Not bad once again but I wouldn’t mind a new idea or two being thrown into the mix. Or maybe not. On the same day that this single was released, BiSH also released another single called “NON TiE-UP” exclusive to Tower Records stores. Perhaps Watanabe really is in all of our heads. There’s already a MV out for the title track and yeah, it’s interesting for sure. Check back soon(ish) for my full review once I’ve managed to get my hands on a copy.